the situation where the ball is deliberately handled is already discussed in the previous bullet point, and again the Law makes a difference between denying a goal or an obvious goal-scoring opportunity ("denying the opposing team a goal or an obvious goal-scoring opportunity by deliberately handling the ball"). ...well, then it looks to me that this is the clearest example of what 'denying a goal by fouling an opponent' should be. So, why did the referee apply that special provision of Law 12 that allowed him to only give a yellow card to Jorgensen, when this exception is only valid in situations when an obvious goal-scoring opportunity is denied? After all, that paragraph was added to Law 12 because a penalty kick effectively restores the goal-scoring opportunity that was lost, so sending off the offending player would have been too much (Law 12 FAQ #9): indeed, the chance of scoring on a penalty kick is roughly 80%, which is more or less the same chance of scoring that an attacking player has when facing only the goalkeeper during open play. But in this situation, the chance of scoring was easily 99%: the penalty kick does NOT fully make up for the previous situation, and this is why I think the Laws of the Game make a distinction between the two cases. So, was cautioning Jorgensen a mistake under the current Laws of the Game? Or are there any other official rules/interpretations that justify a yellow card and that I'm unaware of? This is simply an editorial oversight. If a player either denies a goal or obvious goalscoring opportunity by committing an offence punishable by a free kick as part of an attempt to play the ball, and this results in a penalty kick being awarded, the player is cautioned for unsporting behaviour instead of being sent-off. In all other cases e.g. pushing, pulling, holding, no possibility of playing the ball, deliberately handling the ball, other misconduct (i.e. entering the field of play without permission), the player is sent-off. 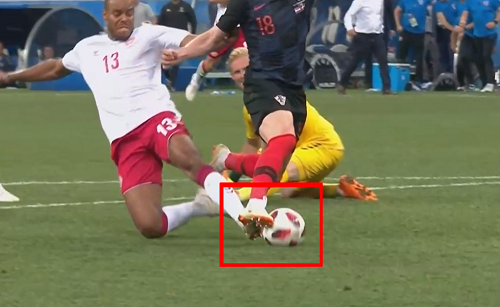 You can't "deny a goal" in this situation because the ball is not even close to entering it; Rebic is still regathering the ball after beating the goalkeeper and hasn't yet beaten the challenge from Jorgensen, and a shot hasn't been taken yet. There are more than enough incidents where a player has been able to walk the ball into the six-yard box and could have walked it into the goal and still missed. To call this particular situation "denying a goal" would be wrong. Once you accept that even a situation where the attacker is extremely likely to score is still only the denial of an obvious goal-scoring opportunity, the remainder of the analysis is moot and the answer is clear. Jorgensen did attempt to play the ball. He fouled Rebic and therefore a DOGSO occurred. According to the laws, this is a penalty kick and a caution (yellow card). The correct decision was made. Not the answer you're looking for? Browse other questions tagged rules football world-cup or ask your own question.